KT3 West Barnes Reliable Rug Cleaners | RDA Cleaning & Maintenance Ltd.
Have a horrible red wine stain in the middle of your living room rug? Then it’s better to call an expert rug cleaning West Barnes KT3 company. All of our skilled rug cleaners are carefully vetted, trained and experienced. They can clean any type of rug from a cheap polyester area mat to an expensive Persian rug. All our quality home and office cleaning services are fully insured. Depending on the rug type you have, either deep dry or steam rug cleaning West Barnes KT3 will be performed. Steam cleaning (also called hot water extraction) is done with a powerful professional hot water extraction machine. First, the rug is shampooed and then rinsed off. During the process, 95% of the water used is extracted back into the machine. This allows for quicker drying and less risk of ruining the rug and the floor beneath it. We were established more than 8 years ago in London. Since then, RDA Cleaning & Maintenance Ltd. has grown and has become one of the top professional rug cleaning companies in the area. 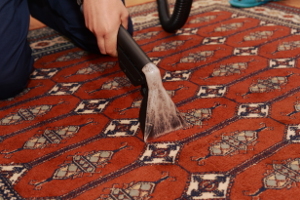 All of our rug cleaners West Barnes KT3 have been thoroughly police background checked. They are trained, experienced, and certified. Order Expert Rug Cleaning West Barnes KT3 From Us Now! You desperately need to hire a professional rug cleaning company in West Barnes KT3 that provides great quality at reasonable prices. Then feel free to give us a call at 020 3404 1646 or use our online booking form. No deposit required, no hidden fees. Working hours: every day of the week from 8am to 6pm.